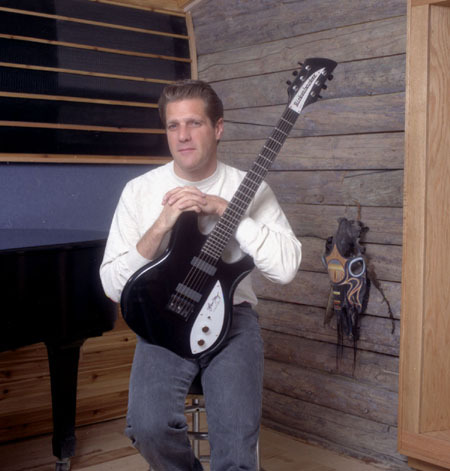 Glenn Frey, international solo recording artist and co-founder of the legendary "Eagles", joined with Rickenbacker to create the "guitar of his dreams". Reflecting a vision of returning to simplicity in an era of ever-increasing complexity, Glenn and the RIC design team created a guitar of exceptional honesty, utility, and durability while avoiding both austerity and garishness. The Glenn Frey Limited Edition guitar, designated respectively as the 230GF, borrows the basic body outline from Rickenbacker's futuristic Series 200/2000 solid body instruments, but further refines the shape with extra contours for comfort. The body, neck, and 24-fret fingerboard are sculpted of solid Maple which is then entirely encased in an ultra high gloss jet black finish. Highly polished wide frets contrast with the slick, gleaming fingerboard. The two high output humbucking pickups are uniquely voiced to offer an exceptional breadth of tone, ranging from the warmest to the brightest. A most useful combination of pickup selector, single volume and tone controls further refine the voice of these instruments. Euro-black parts are used throughout, graced with subtle touches of chrome for distinction. The silver nameplate and pickguard with Glenn Frey's signature complete the look of elegant simplicity. "After more than 20 years in the crazy and complex world of the music business, my joy is a return to the natural, simple life of writing and recording in Colorado and I wanted this to be reflected in my 'ideal' guitar." "The shape is contoured for ease and comfort, the appearance striking, but subtle. The high output humbucking pickups provide a wide range of tones, from the warmest to the brightest, with a simple combination of tone and volume controls - in other words, a guitar for everybody to enjoy. This guitar truly represents a return to simplicity. I can get all the sounds I want, and more, from these instruments without clutter or complexity." "I hope you get as much pleasure from playing them as I do." A total of only 1000 of these guitars will be produced, each including a certificate of authenticity. The first 100 certificates are personally autographed by Glenn Frey. Complete with a deluxe hardshell case, the Model 230GF retails for $ 1199.